I am prepared to sell business and residence Lots, Farming or Pine Lands, which I offer upon the most reasonable terms, or receive in exchange labor, oxen, horses, lumber, logs, or personal property of whatever name or nature. Call and see if I don't trade with you. Adin Randall, boundless optimist and horse-trader, added energy and "color" to Eau Claire's formative years. A Yankee carpenter from Madison County, New York, Randall brought his wife, Clamenzia, and infant son, Edgar, to Eau Claire in 1856. Thrilled by the region's vast potential for lumbering, Randall bought and platted land on the west bank of the Chippewa River, and immediately set out to become the town's biggest booster. He schemed with fellow Yankees Daniel Shaw and Jotham Clark to build a canal connecting the Chippewa River to Half Moon Lake, creating a large log holding pond. That same year, he persuaded the firm of Dole, Ingram & Kennedy to buy his portable sawmill. The Empire Lumber Company went on to become one of the most successful operations in Eau Claire. For years Ingram was vexed with Randall, who it turned out, had not "exactly" owned the land upon which the mill was built. For his part, Randall was more booster than businessman. Under the weight of multiple mortgages, he lost all claim to West Eau Claire in 1860. Today, a bronze statue stands in the west side's Randall Park, donated, ironically, by Orrin Ingram. Randall's family home is nearby at 526 Menomonie Street. 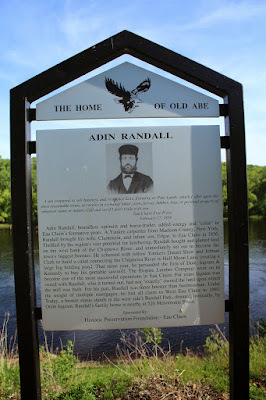 The marker is on the Chippewa River State Trail, adjacent to eastbound Menomonie street, between 6th Street (to the west) and 5th Street (to the east), Eau Claire, Wisconsin 54703. This marker is No. 4 in a series of markers erected by the Eau Claire Landmarks Commission. With the Chippewa River in the background. View across the Chippewa River from the marker location.